Antoni Gaudi’s studies were a process of reflection and analysis of the various architectural styles as he prepared himself for a new language of architecture that was partway between tradition and modernity, a remarkable formal language of his own. First official commission from Barcelona City Council. He designs three and six-armed public lampposts crowned by a winged helmet, a symbol of the commercial power that Barcelona had attained and still had at that time. The lamps were gas-powered and stand in Plaça Reial and in Pla del Palau to this day. Design of an iron and glass display case for this glove shop on Carrer d’Avinyó. The cabinet was shown at the World’s Fair in Paris that year, where it was admired by the industrialist Eusebi Güell i Bacigalupi. So surprised was he at the quality of the display case that he wished to meet its designer and so began the relationship between him and the architect. Design of furnishings for the chapel that the López family had near the Palacio de Sobrellano in Comillas (Santander). The furnishings consisted of an easy chair with a high back, a prie-dieu and a pew. The pieces were made by the carpentry workshop of Eudald Puntí (Barcelona) around 1880, when the chapel was ready for use. The furnishings, which still survive, feature plant themes in the ogival style and depictions of animals. Project for the construction and decoration of the chemist’s owned by Joan Gibert i Soler on Passeig de Gràcia in Barcelona. The design consisted of a sign, two exterior display cases, a marquetry counter and a wooden bench. The establishment was demolished a few years later. Gaudi devised the masterplan for the La Obrera Mataronense textile mill, the first workers’ co-operative in Spain. Following completion of his designs for the co-op’s flag (1873), the recreational club (1878) and housing for the workers (1878), Gaudi continued to work on other projects, such as the weighbridge and porter’s lodge (1883), the society’s standard (1884) and the decoration of a room for a cultural festival (1885). His most notable work here, however, was the Bleaching Room (1883), a large room where the bleach boilers and washing vats were held and the cotton was left to drip dry. The building was extremely simple in its design, with 13 slender yet solid parabolic arches, made of small lengths of wood joined together using bolts. 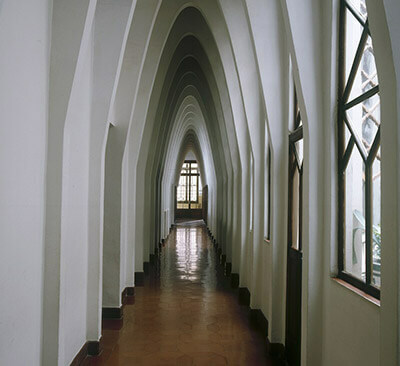 These arches enabled Gaudi to create a large open space of almost 600 square metres without the need for internal partitions or structural systems such as columns or pillars. Casa Vicens ©Casa Vicens. Pol Viladoms. Gaudi’s first residential project was commissioned by Manuel Vicens. It was designed as a summer residence with gardens in which geometrical forms and rich ornamentation, inspired by the local plant life, are present on the exterior of the property, as well as in its various interior spaces. Casa Vicens presents strong medieval and Arabic influences in most of its rooms, such as the famous smoking room. 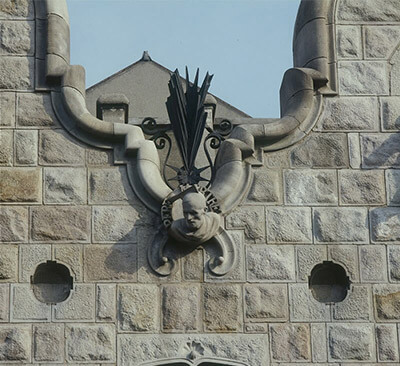 One aspect worthy of note is Gaudi’s early use of industrial production methods in, for example, the tiles and the iron railings in the form of a palmetto. 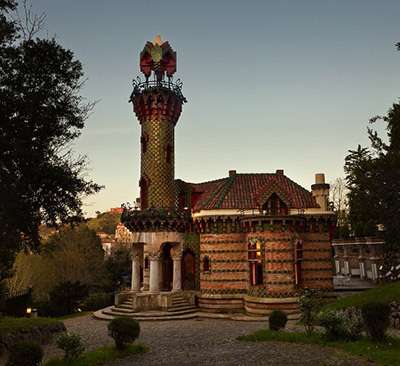 While he was building Casa Vicens, Gaudí was commissioned to build this summer villa by Máximo Díaz de Quijano, who had returned from the Americas a wealthy man. Díaz de Quijano was the brother-in-law of Antonio Lopez, the Marquis of Comillas and the father-in-law of Eusebi Güell. This building bears a clear Eastern influence, especially in the tower that is reminiscent of a minaret. The exterior of the building is notable for the use of stone in the lower part and of exposed brick decorated with bands of glazed tiles depicting sunflowers. Impressive in appearance, the work marked a step forward in Gaudi’s search for a distinctive style of his own. When Gaudi took over the direction of the work on the church, its Gothic Revival floor plan had already been built by Francisco de Paula del Villar, with whom Gaudi had begun to work while he was studying at the school of architecture. During the almost 40 years that he worked on the church, until his death, he designed the apse and the Nativity Façade, he delimited the perimeter and he crowned one of the bell towers, the St. Barnabas bell tower. The design of the building is the finest expression of Gaudi’s geometrical and structural approaches. Gaudi designed a church with the floor plan of a basilica with a nave and four aisles and a transept with three aisles, resulting in a Latin cross floor plan. The basilica has three monumental facades that represent the three most important moments in the life of Jesus: His Nativity, Passion and Glory. 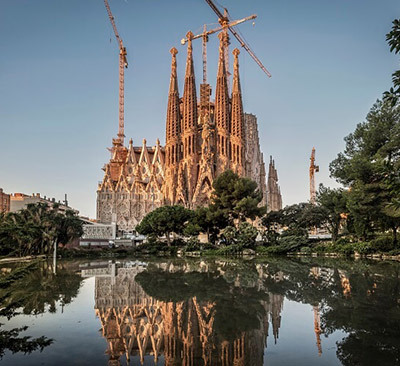 The building will be crowned by 18 towers reaching between 100 and 170 metres high: twelve towers will represent the apostles, four the Evangelists and two, the highest of all, will be dedicated to Mary and to Jesus. Sagrada Família was officially consecrated as a Catholic basilica in 2010. This is Gaudi's first work for his great patron, Eusebi Güell: two pavilions of access to the farm that has to the north of Barcelona, destined to the house of the porter and the horsemen with picador. Gaudi resolved the structure of the pavilions from roundabouts and parabolic arches, using the brick as a basic building material with rich arabizing decoration. The use that for the first time made of the ceramic trencadís for the coating of the towers of access, and the spectacular grate of wrought iron in the form of dragon of the carriage door. This figure represents the guardian dragon of the Garden of Hesperides defeated by Hercules, in an episode that Jacint Verdaguer tells the poem L'Atlàntida. As the World’s Fair of 1888 approached, Eusebi Güell commissioned Gaudi to design his family residence, which he also intended would serve as a place for holding receptions. The building consists of six levels around a large central hall roofed by an impressive parabolic dome that allows natural light in. Another notable feature is the stables in the basement, reached by helicoidal ramps, and the rooftop. Here Gaudi broke dramatically with tradition, presenting the chimneys and ventilation towers as sculptural elements faced with trencadís. 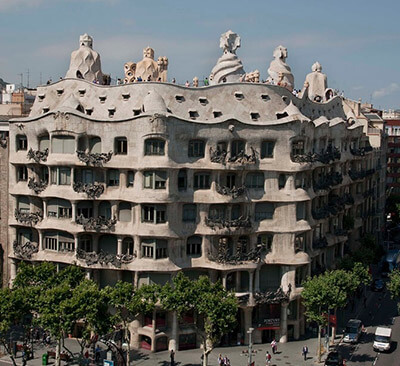 He repeated this type of rooftop on Casa Batllo and Casa Mila (La Pedrera). In 1886, a blaze completely destroyed the home of Joan Baptista Grau i Vallespinós, originally from Reus and by then the bishop of the diocese of Astorga in north-western Spain. The bishop entrusted the construction of a new building to his friend Gaudi. This palace of Gothic Revival look, due to the structure and the sober appearance of the stone walls, has four levels lit by natural lighting that shines into a central space that runs through the building. Following the bishop’s death, disputes arose between the architect, the canons and the Diocesan Board, and Gaudi resigned, leaving the work unfinished. Temporary building erected for the 1888 World’s Fair. 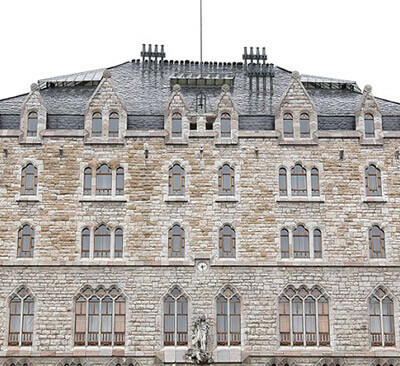 This pavilion was used to display the products and services of the maritime shipping company Companyia Transatlàntica, owned by Antonio López, the Marquis of Comillas. The pavilion was the same one that Adolfo García Cabezas had constructed in 1887 for the Maritime Exposition in Cadiz. Gaudi refurbished it and put it to new use. He dramatically altered its exterior appearance, adding four lofty towers, redoing its portico and adding a number of masts. The pavilion was demolished in the 1960s when the Passeig Marítim in Barcelona was built. Building to be used as a convent and boarding school, commissioned by the Congregation of St. Teresa. The construction had to be cheap and simple. 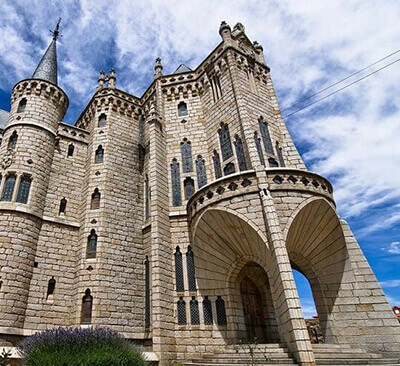 Gaudi conceived the school as an original Gothic Revival castle with a façade that combines stone and brick. The incorporation of religious symbols is the predominant feature, with anagrams of Jesus Christ, Carmelite coats of arms and four-armed crosses on the towers at the corners. The building has four levels and has three corridors that run lengthways, the central one of which serves to let light enter and as a passage along which people can circulate. A notable feature in the school is the use of parabolic arches in the central part, the two lateral parts and the various circulation spaces. Other elements worthy of interest are the windows and the entrance porch, which is closed by a wrought-iron grille. Gaudi designed this building consisting of rented apartments and commercial premises for Simón Fernández Fernández and Mariano Andrés González Lluna, the representatives in León of the Banc Hispano-Colonial de Barcelona and the owners of a foreign exchange bureau and a textile warehouse. The building has a trapezoid floor plan. Its external appearance calls to mind a medieval castle, though the interior is that of a functional, mixedconstruction property with load-bearing walls in the apartments and iron pillars in the commercial areas. Winery where Eusebi Güell i Bacigalupi made wine in the Garraf, to the south of Barcelona. Gaudi’s collaborator Francesc Berenguer contributed in a very direct way to this building. The winery consists of two buildings, the porter’s lodge and the cellars. In the cellars, the eye is drawn to the use of the parabolic arch, which defines its pyramidal shape. A commercial building with rented apartments as well, commissioned by the children of the industrialist Pere M. Calvet. The six-storey building is a transitional work between the early Gaudí, with neoclassical and Baroque influences, and the mature Gaudi, who worked with curving lines and undulating surfaces. The interior courtyards are notable for their luminosity. 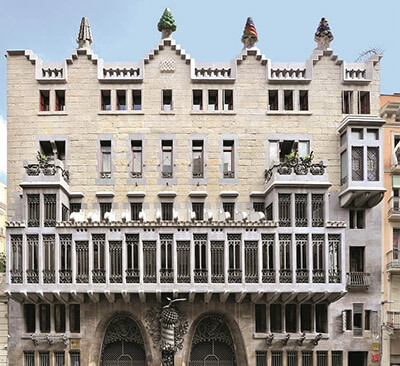 Barcelona City Council awarded Casa Calvet a prize as the best building of 1900. An unfinished building featuring tremendous structural experimentation, intended to be the church at Eusebi Güell’s model textile village. 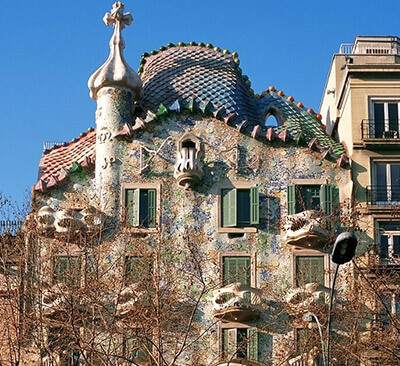 For this building, Gaudi researched and made an innovative architectural projection device, a large polyfunicular model constructed using fabric, cord and small weights. The model enabled him to deduce architectural forms dictated by the static behaviour of the building. He used the same model in the construction of Sagrada Família. Notable features include the use of ruled geometry and the variety and provenance of the many and varied materials used and re-used by Gaudi in this early phase of the church: the textures and colours of basalt and limestone, brick, slag, ceramic, glass and wrought iron are combined to ensure the building blends in with its surroundings. A standard for the choral society of Sant Feliu de Codines, today held in the municipal museum of this town near Barcelona. The standard is 1.75 metres high and bears a cross and a large disc, both made of cork with brass appliqués. Strips of leather with small bells hang from the cross, and pine cones from the circle. A private garden city promoted by Eusebi Güell, intended to occupy 15 hectares in the north of Barcelona. Gaudi designed the infrastructure and the services. Conceived initially as a model garden city integrating architecture and nature, this luxury residential area was never completed. Of the 60 building plots, just three were sold, one of them to Gaudi himself, who went to live there with his father and niece. Antoni Gaudi designed the two porter’s lodges and a large landscaped staircase that takes visitors up to the Hypostyle Hall, where the garden city’s market was intended to be held. Above the hall, a large esplanade was laid out, with a bench with undulating profile built all around its edge. The bench was constructed of prefabricated concrete pieces faced with ceramic trencadís. The floor of this upper square rests on a series of spherical caps (hemispheres). Hidden below the floor of the square, they collect the rainwater and channel it through pipes inside the columns down into an underground cistern. The overflow pipe for the excess water in the cistern ends in the mouth of the famous dragon on the staircase that greets people as they enter the park. Commissioned by the Spiritual League of Our Lady of Montserrat, Gaudi designed the First Glorious Mystery of the Monumental Rosary that work had then just begun on near the shrine of Montserrat. He saw this First Mystery, which represents the Resurrection of Christ, as the resurrection of Catalonia. 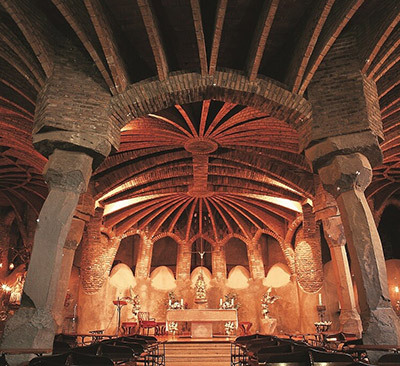 Gaudi proposed to extend the cave where the image of Our Lady of Montserrat was found and to create a large square there. 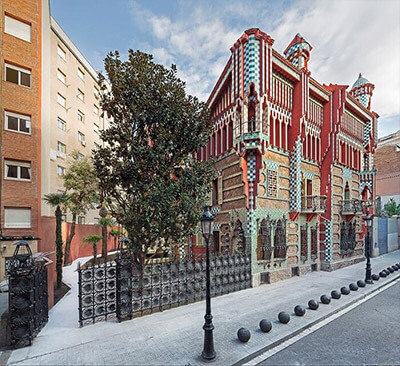 A detached family home partway between the Gothic style and Modernisme that is cubic in volume, built in the north of Barcelona and structured on five levels. The site where Gaudí built Torre de Bellesguard has a potent medieval past, as this was the place that the last king of the Catalan dynasty lived. The architect created a work loaded with symbolism and on it he tells the life story of Martí the Humane and the luckless fate of the monarch and of the kingdom on his death. The structure of Torre Bellesguard is faced with local slate stone, in keeping with his habit of studying and using the geology and topography of the place. Notable features are the slender spire in one of the corners and the interior construction solutions, the attics and the parapet walk around all four facades, which he was also to use later in his design for Casa Batlló and La Pedrera. Draft project to reform the main façade of the shrine. Few documents concerning this project have survived. Gaudi’s proposal was not pursued because the church’s administrative board regarded it as too ambitious. Perimeter wall and entrance gate to the Finca Miralles estate in the north of Barcelona. Only a small section has survived of the 36-metre-long wall, topped by railings made of sheet metal. In contrast, the large door in the form of an inverse lobed horseshoe arch covered by a canopy and crowned by a cross has been preserved intact. The owner of the estate was his friend Hermenegild Miralles i Anglès, the printer who had more than once loaned his enormous printing presses to the architect so that he could use them to test the resistance of the stone columns he employed in some of his works. A joint project with Ricard Capmany, the official decorator of this bar that specialised in selling Martini & Rossi vermouth, situated on Passeig de Gràcia in the centre of Barcelona. The many artists and craftsmen who also worked on this project included the Fratelli Tosso and the Società Musiva Veneziana, from Venice, Michael Thonet, from Vienna, and the Catalans Eusebi Arnau, Pere Falqués, Josep Puig, Manuel Ballarín, Antoni Bordalba, Octavi Domènech, Masriera i Campins and E. Saumell. Gaudi contributed the wood panelling and the varnished pressboard used to face some of the walls, such as those in the Arab Room. The slabs were supplied by the company of Hermenegild Miralles, for whose estate Gaudi was then constructing the entrance and perimeter wall. In 1902, the Bar Torino was awarded the prize for the best establishment of the year by Barcelona City Council. Even so, it was later demolished and the site was occupied by the Joieria Roca (1934), designed by Josep Lluís Sert i López and Josep Torres Clavé. Restoration work commissioned by the Bishop of Mallorca, Pere Campins i Barceló. The work consisted of moving the choir to a new position in the cathedral, opening the Chapel of the Trinity, installing new thrones, opening the large Gothic windows, fitting stained glass windows, installing a baldachin, decorating the building with paintings and furnituremaking. Casa Batlló ©Fundació Catalunya La Pedrera. Photographer Xavier Padrós. Extension and renovation of a housing estate between mediators, commissioned by Josep Batlló Casanovas. 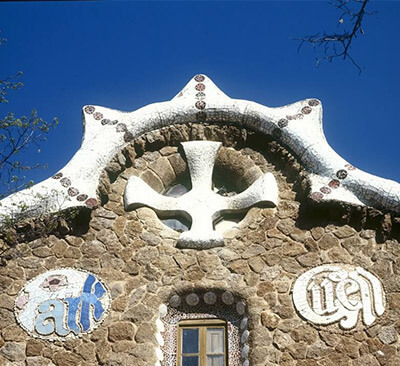 Popularly known as the house of the bones, the house of the masks, the house of the beards or the house of the dragon, the work is part of the stage of maximum constructive maturity of Gaudi. Gaudi's intervention in this building was not only ornamental but also structural, as it reconstructs the exterior and back facades and the inner courtyards of a building characteristic of the Eixample with the aim of entering more natural light into the building , which also adds two plants and a new crown. The facade is covered with polychrome trencadís. The roof of Casa Batllo is the natural evolution of the roof of the Palau Güell, with the chimneys covered with glass and color trencadís. Gaudi was commissioned by the painter Lluís Graner i Arrufí to design this venue where shows of assorted types were put on, situated on Rambla dels Estudis. The building had an entrance lobby, a waiting room and an auditorium decorated as if it were a cave. 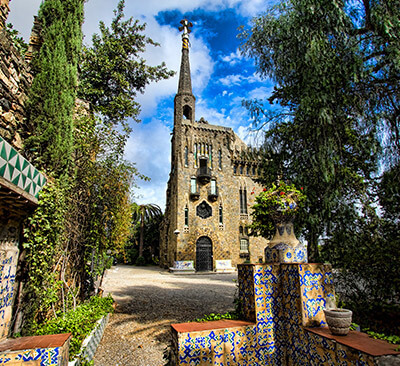 Chalet built by Eusebi Güell i Bacigalupi in La Pobla de Lillet (Berguedà), where he owned coal mines and a Portland cement factory, the first in Spain. The building was formed by two walls (the façade and roof), one of which incorporated a semi-circular double staircase up to the entrance. Part of the original structure was later demolished when it was converted into a hostel for children’s holiday camps. In the same town, Gaudi designed gardens for the textile manufacturer Joan Artigas i Alart. Standard commissioned by the guild’s board of directors. The standard consisted of a dark green flag (1.7 x 2.5 metres) bearing the coat of arms of the city and the image of St. Eligius, the guild’s patron saint. The standard was burnt at the start of the Spanish Civil War (1936). Gaudi's property for rent and last civil works, which summarizes the stage of maturity of the artist. Although its official name is Casa Mila - because it had been a real estate initiative of this family -, it is popularly known as La Pedrera, nickname that refers ironically to the external aspect, very similar to that of an open quarry. With an imposing undulating stone facade and wrought iron balconies formed by recycled elements, La Pedrera is the most innovative building of Gaudi, both for structural design and for decorative elements. Resolved around two large courtyards, in the apartments the structure is made of stone and brick pillars, in a precursor free floor system. The attics, that housed the utility bins and the clothes racks, are constructed by means of a set of multi-strand catenary brick arches, which determine the different levels of the roof. 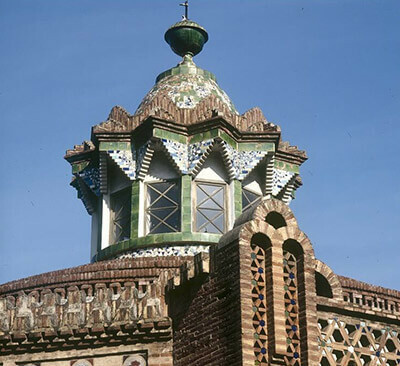 The roof follows the scheme used at the Palau Güell and Casa Batlló. Here, however, the buckets or scale boxes are covered with stone, marble and ceramic-monochrome and recycled trencadís, and the two vents and chimneys are stuccoed, less a group that presents pieces of green bottles. It is necessary to emphasize the plaster ceilings, the paintings of the lobbies and the access doors. Project for the construction of a hotel in New York. The architect was commissioned by two Americans familiar with his work and did several drawings for a large hotel, which was never built. While constructing Sagrada Família, Gaudi erected the temporary schools building, intended to provide an education for the children of the labourers working on the church and other children in the neighbourhood. Situated at the south-west corner of the church, this single-storey building is of extreme constructional simplicity. This was an extremely cheap and quickly built project. The roof is made of sun-dried brick and follows the geometrical and structural logic of ruled surfaces. The result is maximum strength while using minimum materials. During a three-week stay in Vic, where he was recovering from an illness at the invitation of the municipality, Gaudi submitted various projects to commemorate the centenary of the birth of the local priest and thinker Jaume Balmes. Antoni Gaudi designed two lampposts of different heights in the shape of an obelisk, which were built using basalt and wrought-iron appliqués. The bishop of the diocese of Vic, Josep Torras i Bages, a great friend of his, unveiled them on 7 September 1910. They were demolished around 1924.